Puppies and babies can be a tough combo to juggle, but adopt a young or older adult dog who’s already trained and good around children, and the mix can be magical! Here are some of the many benefits of dogs being in children’s lives. Although childhood isn’t always easy, having a pet provides constant companionship through the ups and downs. Dogs can be a great source of comfort for kids — even when they’re coming to grips with difficult life lessons. Whenever kids feel sad, angry, or afraid, they can always turn to their pet. Petting and cuddling dogs has also been shown to relieve stress and help people relax. Caring for a dog also encourages a more active lifestyle. In fact, a recent study showed that kids with dogs exercise eleven minutes a day more than their non-dog owning peers. That might not sound like a lot, but over a week or month, it really adds up. Many dogs require daily walks or runs and plenty of play time. Those adorable puppy eyes they give you are sure to motivate you — even when you’re not feeling up to it. Having a pet is a great way to teach responsibility to kids. 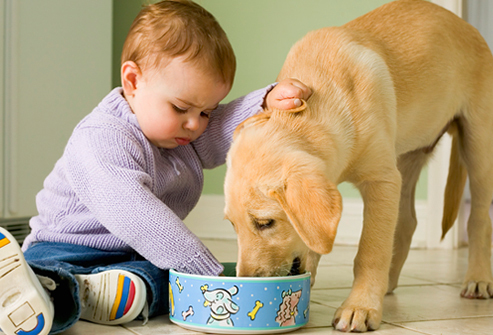 Making sure that the family dog has food and water gives children a first glimpse of accountability and obligation. Children also learn empathy and compassion by caring for their pet, while developing a higher level of self-esteem by taking care of their pet-owning responsibilities. Recent studies have found that babies raised in close contact with a pet get sick less often in their first year of life, meaning fewer visits to the doctor’s office. Exposure to pet dander and the microbes that pets carry into the home from the outdoors is suggested to improve babies’ developing immune systems. Research has also found that children who grow up with dogs experience a reduced risk of allergies. 5. Don’t Worry, Be Happy! Perhaps one of the greatest benefits of dogs in early childhood is simply that they make children happy! Interaction with animals has been proven to raise levels of serotonin and dopamine, which are the chemical building blocks of positive feelings. All science aside, playing and interacting with dogs is just plain fun — and it’s bound to brighten any kid’s day. Want to learn more about Dogs? Check out these articles! Dogs are thought to have been first domesticated in East Asia thousands of years ago. People primarily used dogs for guarding the hunters and areas of land.Read More..
To Know more information about pets Join Our community and pages!! I like the post? Like this!